Here are the known facts -- the police estimate was 40,000 while the organizers claimed 50,000. Now you go figure out how some of these reports can come out like they did. Specifically, the western media quoted only the police estimate and refuse to mention the number given by the organizers. You are going to compare to what these same media have to say concerning the afternoon event. 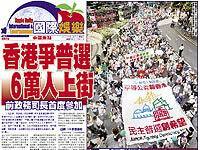 (Ming Pao) 13:25, July 1, 2006. [in translation] Parade Planning Committee Convenor Cheng Yiu-tong estimated that the number of marchers is bigger than that of last year, and the total is at least 30,000. (Deutsche Presse-Agentur via Monsters and Critics). July 1, 2006. Earlier Saturday, an estimated 30,000 people attended a rival event at the Hong Kong Stadium celebrating Hong Kong's return to Chinese rule organized by a coalition of pro-China groups. (Reuters) 12:08pm BST, July 1, 2006. By John Ruwitch. Earlier in the day, thousands took part in a parade organised by the pro-Beijing Federation of Trade Unions. Police said 40,000 people participated. (Associated Press via South China Morning Post) 17:38, July 1, 2006. Beijing loyalists held a parade on Saturday to celebrate the handover anniversary. Organisers and police said about 40,000 people turned up for the event, which featured traditional lion dances and a marching performance by hundreds of Chinese soldiers. (BBC News) July 1, 2006. A pro-China rally held earlier in the day also attracted large numbers of people - police said 40,000 took part. (Associated Press via Washington Post) 8:01 am EST. By Marco Liu. July 1, 2006. Earlier Saturday, pro-Beijing groups held their own parade that attracted 40,000 people, police and organizers said. The event involved schools, civic groups, and entertainers such as Chinese lion dancers and children dressed in Chinese opera costumes. Hundreds of Chinese soldiers also took part for the first time. (Los Angeles Times) July 2, 2006. Pro-Beijing groups held a parade that attracted 40,000 people, police and organizers said. (South China Morning Post) Thousands take to streets for democracy. By Ambrose Leung & Associated Press. 7:48pm HKG, July 1, 2006. Meanwhile, Beijing loyalists held a parade on Saturday to celebrate the handover anniversary. Organisers and police said about 40,000 people turned up for the event, which featured traditional lion dances and a marching performance by hundreds of Chinese soldiers. 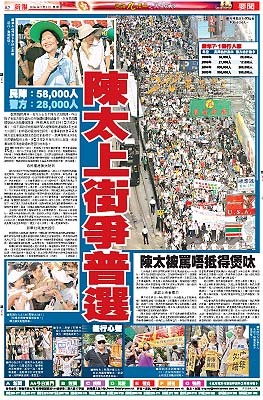 [in translation] For the parade organized by nineteen trade unions to celebrate the return of Hong Kong, the organizers claimed 50,000 particpants while the police said that there were 40,000 persons. (Sing Tao) July 2, 2006. [in translation] The planning committee claimed that more than 30,000 people were in the parade, but the police said that there were 40,000. (The Sun) July 2, 2006. [in translation] The organizing unit estimated 50,000 people participated, but the police counted 40,000. (Taipei Times) July 2, 2006. A rival march organized by pro-China groups yesterday morning also attracted a large turnout with organizers estimating that 50,000 participated, while police put the figure at 40,000. Now you go figure out how some of these reports can come out like this. Thousands of people took to the streets of Hong Kong Saturday in a pro-democracy march on the ninth anniversary of the territory's return to Chinese rule. ... Early estimates suggest the crowd was in the tens of thousands but a long way short of the 500,000 who attended the first of the July 1 marchs in 2003 and 2004 when Hong Kong was in an economic slump. (SAPA-AP via IOL) 11:04AM (South Africa), Just 1, 2006. Thousands of people began marching for an annual pro-democracy rally in Hong Kong on Saturday, marking the ninth anniversary of the former British colony's return to Chinese rule. More than 4 000 protesters carrying banners that said "Equality, justice, fight for democracy" and "When will we get a timetable for full democracy?" began filing out of Victoria Park and made their way to the government headquarters. The annual demonstration drew far fewer people than in previous years, when as many as half a million marched peacefully for the right to pick their city's leader and entire legislature. Thousands of people marched in central Hong Kong to demand full democracy on Saturday, the ninth anniversary of the former British colony's return to Chinese rule. Police estimate 19,000 people started the march, but the crowd grew as the demonstrators moved through the city chanting slogans and blowing whistles. ... In 2003 and 2004, half a million or more people joined the march, upset at the weak economy and the government's mismanagement of various issues. But last year after the city's unpopular leader Tung Chee-hwa resigned, the number of participants fell to around 20,000. Thousands turned out for the annual rally of Hong Kong's pro-democracy movement on Saturday, while a pro-central government parade also drew thousands to mark the ninth anniversary of the former British colony's return to Chinese rule. More than 19,000 protesters carrying banners that said "Equality, justice, fight for democracy" made their way to the government headquarters - in marked contrast to the half a million people who marched in 2003 and 2004 to demand the right to pick the territory's leader and entire legislature. Analysts predicted that up to 50,000 would join the pro-democracy march by the end of the day. The movement for democratic reform has lost momentum because of a steadily improving economy and leadership changes in Hong Kong. Tens of thousands of people have joined a rally in Hong Kong calling for full democracy in the territory. Organisers say 58,000 took part; police put the figure at 28,000. The marchers, some blowing whistles, carried banners reading "Justice, Equality, Democracy". 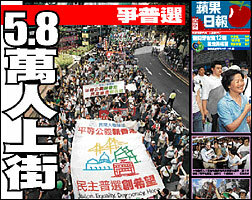 (Ming Pao) 19:21, July 1, 2006. [in translation] The Civil Human Rights Front estimated 58,000 persons were in the march. The police said that when the march departed from Victoria Park, there were 19,000 persons but the total number of marchers was 28,000. Both Civil Human Rights Front and police estimates were higher than their respective numbers last year. Last July 1st, the Civil Human Rights Front claimed 21,000 while the police claimed 17,000. Thousands chanted slogans and marched through Hong Kong's streets in a pro-democracy protest Saturday, while a pro-Beijing parade also drew a big crowd to mark the ninth anniversary of the former British colony's return to Chinese rule. Police said 28,000 people joined the pro-democracy event, while the organizers estimated that 58,000 attended. The protesters shouted, "Full democracy now!" and carried banners saying "Equality, justice, fight for democracy" as they strolled toward government headquarters. (Hong Kong University Public Opinion Programme) July 1, 2006. Time: 400pm-429pm: Lane 1: 32; Lane 2: 35; Lane 3: 21. Total= 88. Time: 430pm-459pm: Lane 1: 1,615; Lane 2: 2,308; Lane 3: 1,776. Total: 5,699. Time: 500pm-529pm: Lane 1: 1,768; Lane 2: 2,106; Lane 3: 1,894. Total: 5,768. Time: 530pm-559pm: Lane 1: 1,993; Lane 2: 3,114; Lane 3: 2,954. Total: 8,061. Total: Lane 1: 7,900; Lane 2: 9,997; Lane 3: 8,999. Total: 26,896. Last year, HKU POP conducted telephone interviews with those who claimed to have participated and found that 68.9% had passed through the Arsenal Road counting station with a 95% confidence interval of plus or minus 6.3%. Consequently, the adjustment factor between 1.33 and 1.60 was applied to the raw count. Multiplying 26,896 by 1.33 and 1.60 would yield an estimate of the total number of marchers between 36,000 and 43,000. HKU POP will be running the telephone interviews again this year. (Hong Kong Daily News) July 2, 2006. [in translation] On the ninth anniversary of the return of Hong Kong, different people used different ways to remember. Apart from the official flag-raising ceremony and the celebratory cocktail party, civic organizations held a big parade with 50,000 citizen supporters (the police estimated 40,000). But the Civil Human Rights Front, an organization disssatisfied with the government, held its fourth annual July 1st march to complain about the governance in the Hong Kong Special Administrative Region. With the support of former Chief Secretary Anson Chan announced beforehand, the Civil Human Rights said that 58,000 citizens answered the call to march, but the police estimated that there were only 28,000 marchers. 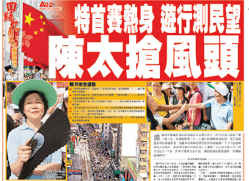 In an unusual move, the Xinhua News Agency reported the news of a Hong Kong march. (in translation) The Civil Human Rights Front announced that 58,000 people marched, more than double the 21,000 last year. Spokesperson Lee Wai-yee believes that the participation of Anson Chan was a reason. But Hong Kong University Statistics and Actuarial Science Department estimated 26,000 to 29,000 persons. The Hong Kong government insiders believed that there should have been 40,000 to 50,000 when Mrs. Chan promoted the event with full effort and it would take more than 100,000 to show her political power. The final result astounded even the government The government insiders assessed that when Mrs. Chan became the focus of the march which did not get a huge increase in attendance, she would be held responsible for the pan-democratic camp. (Apple Daily) July 2, 2006. (in translation) Hong Kong University Statistics and Actuarial Science Department senior lecturer Ip Siu-fei has been counting the number of marchrs for many years. Yesterday, he sent 10 people to conduct a survey along the route and calculated the number of to be between 23,400 and 29,400, of which 91% had started from Victoria Park. (Sing Pao) July 2, 2006. (in translation] Last evening, the Civil Human Rights Front announced outside Government Headquarters that 58,000 people marched but the police estimate was 28,000. 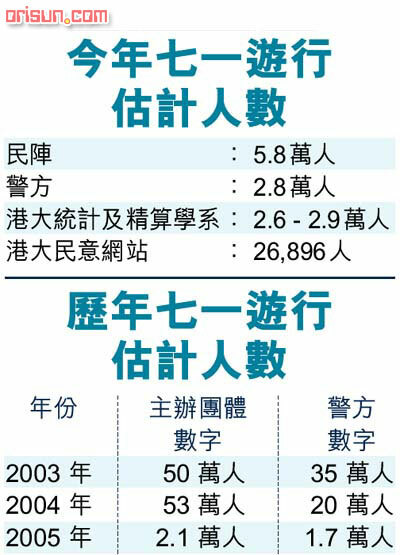 The Hong Kong University Statistics and Actuarial Science Department announced last evening the number was between 26,000 and 29,000 while the Hong Kong University Public Opinion Programme estimated between 36,000 and 43,000. Civil Human Rights Front spokesperson Lee Wai-yee said that when the assembly began in Victoria Park, some citizens were waiting outside the soccer fields and this gave the impression that there were fewer people than last year. Actually, when the march began from Victoria Park, the Civil Human Rights Front estimated that the people should take up five soccer fields with more people joining in during the march. She said taht the marchers did not only join because former Chief Secretary Anson Chan was in the march, but that there were many more factors. Each soccer field should hold 10,000 people. The Hong Kong Unviersity Statistics and Actuarial Science Department had two stations at Causeway Bay and Admiralty to count the number of people. The statisticians were divided into three teams, and then they also surveyed the marchers in order to estimate the number of people who joined the march midway. The Hong Kong University Public Opinion Programme's student research team counted all day at the pedestrian overpass at the intersection of Hennessy and Arsenal Streets and counted 26,896 persons, not including those who left before or joined after the point. The final number was adjusted based upon survey data from last year. (Ming Pao) July 2, 2006. [in translation] For the third year in a row, Ming Pao commissioned satellite photo expert Thomas Lee to use "aerial calculations" to estimate the number of marchers on July 1st. The results is 22,141 (not counting those joined in the middle of the march). When the first marchers reached Tin Lok Lane in Wanchai, the last marchers were leaving Victoria Park. Therefore, the total area occupied by the marchers was only 0.4 of the entire route. Based upon the road surface area and the density (124 persons per 100 square meters), the number of marchers was estimated. Our newspaper commissioned satellite photo analysis company owner Thomas Lee who is a geographical surveyor to use aerial photos of the procession to estimate the number of marchers by "aerial calcluations." The entire roadway was approximately 72,000 square meters. When the end of the procession departed from Victoria Park at 415pm, the marchers occupied 0.4 of the roadway. The software analysis of the Wanchai marchers (at Hennessy Road and Tin Lok Lane) showed that the marchers only occupied by 0.629 of the roadway with a density of 124 persons per 100 square meters. From this it is inferred, that the number of marchers is 22,141 (not including those who joined in the middle of the march). Also, Hong Kong Statistics and Actuarial Science Department senior lecturer Ip Siu-fei's statistical group estimated the number of marchers to be 26,400 (plus or minus 3,000). Ip Siu-fei's team had five people in teams on the pedestrian bridges at Percival Street (Causeway Bay) and Pacific Place (Admiralty). For every five minutes, they counted the number of people who passed the point, and they estimated the number of marchers to be 26,400. Ip estimated that about 2,000 of those people joined in the middle of the march and the tolerance is plus or minus 3,000. Therefore, the number of estimated marchers is between 23,000 and 29,000. Also the Hong Kong University Public Opinion Programme sent people to the pedestrian overpass between Hennessy Road and Arsenal Streets and counted the number of marchers to be 26,896. Based upon the ratio among the people who went past that point last year, they estimate the number of marchers to be between 36,000 and 43,000. A youth group canme up with an estimate of 38,900. (Oriental Daily) July 2, 2006. (in transaltion) The Civil Human Rights Front used the same calculation method for the 12/4 march and in the end counted 58,000 persons at the July 1st march, or 77% down from 12/4. The police said that only 28,000 persons marched; the Hong Kong University Statistics and Actuarial Science Department announced that the number of marchers was between 26,000 and 29,000; the Hong Kong University Public Opinion Programmed estiamted the number of marchers to be between 36,000 and 43,000. (Apple Daily (Taiwan)) July 2, 2006. [in translation] Number of participants: The authorities estimated 19,000 persons; the organizers claimed almost 60,000 persons. Police, who usually underestimate turnouts for pro-democracy events, said 19,000 set out on the march but organizers said a total of 58,000 people took part. The turnout was clearly greater than the 20,000 to 30,000 who took part last year but a long way short of the 500,000 who attended the first of the July 1 marches in 2003 and 2004. This page will be updated as different estimates come in. See the links at the bottom of the page of the controversies in past years.